We will post the running order in the coming weeks. There are four-day passes available for the festival, as well as day tickets for Friday 5th of July and Sunday 7th of July. In the coming weeks there will be day tickets available for Thursday 4th of July and Saturday 6th of July. You can purchase your tickets and four-day passes for Rock Fest Barcelona through this link. The only valid tickets are those purchased through the official sales channels (RocknRock and the Ticketmaster network). The organization cannot guarantee the validity of tickets that haven’t been purchased through official outlets. The day tickets and four-day passes will be exchanged for access wristbands at the designated exchange points at the festival entrance. The wristband allows you to access and exit the festival as much as you want. Any ticket or wristband that is broken or damaged will authorize the festival organization to deny access to the venue. Wristbands are personal and cannot be transferred to anyone else. It is mandatory to carry your wristband for the whole duration of the festival. You must show it to access the venue and if you are required to do so by the organization personnel at any moment. Keep your wristband so the organization personnel can identify it. Don’t take it off under any circumstance as no wristband will be substituted. In case of loss or damage, you lose your right to access the festival. There are no discounts available with any type of card. Children and teenagers under 16 Years old are allowed to enter, but need to be accompanied by a parent, legal guardian or with a recognized adult over 18 Years who will be responsible for the underage during the whole festival and will have to complete and submit a “Responsibility sheet” at the box office before entering the festival site. If the accompanying responsible adult is not the parent or legal guardian, it will be necessary to submit, together with the responsibility sheet, an authorization by the parents or legal guardian and a copy of their legal ID or Passport. Do not forget to bring with you your documentation (ID or passport) and that of the children under 16 (underage’s ID or family book). The underage’s documentation is mandatory to be granted access to the festival. It is not necessary that children under 12 at the time of the festival buy a ticket or pass. If the children is 12 or older at the time of the festival, a ticket will be needed to access the venue. There are no discount available for children over 12 and below 16. Due to the music volume inside the festival, organizers recommend children to wear hearing protections (earplugs, earmuffs…). The organization is not responsible for any damage or hearing loss. Download here the Responsibility Sheet. The festival organizers provide facilities for people who require special attention. Inside the festival you will find an area where you can see the shows from a designated platform. You will also have dedicated toilets. In order to access this area it is mandatory to show, together with the tickets or four-day passes the document that prove effectively your conditions of reduced mobility that made you purchase the reduced mobility ticket. The people accompanying people with reduced mobility must buy the “Companion ticket” and will be placed in an space next to the person with reduced mobility. 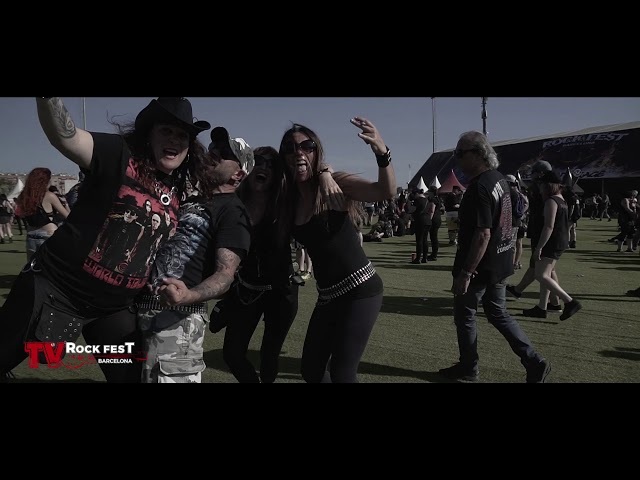 Rock Fest Barcelona has a special seating area for people with special needs (advanced pregnancies, medical problems or mobility difficulties…) who wish to attend the festival. In order to access this area you don’t need a ‘reduced mobility ticket’ but you will need to obtain and show a medical certificate proving your condition. In all designated areas for people with reduced mobility or medical conditions preference will be always for the affected people and not their companion. It is not allowed to access the concert area with food or drinks. You can find a variety of food stands and bar areas within the festival site. There will be a bar where you can purchase gluten-free drinks, sugar-free soft-drinks, alcohol-free beer and other varietys for those who need them. Rock Fest Barcelona is very conscious about alimentary allergies and intolerances and we work hard on finding a diversity of vegan, vegetarian and gluten free options in the festival area. Soon we will give more detailed info about this aspect. The Festival offers public health care points. Please do not hesitate to go if you need help. At the Festival there is a cloakroom service available at the entrance. It is not allowed to enter the Festival with any kind of object that is considered dangerous, such as bottles, cans or any kind of container, glassware, knives, laser pointers, sprays, etc. You can leave these objects considered dangerous or not permitted at the cloakroom service. All objects found during the festival will be deposited at the festival’s cloakroom. If you find any object lost at the festival site, please bring it to the cloakroom. Once the festival is finished, unreturned objects will be given to the local police department of Santa Coloma de Gramenet, which you can contact on +34 934 624 010. You can find info related to parking at the “How to get there” area of the website. Inside the festival area you can find a space where you can purchase official festival and band merchandise. There is also a dedicated market where you can find jewelry, patches, t-shirts of other artists, and so on. Rock Fest Barcelona will organize signing session with some of the artists playing this edition. The signing sessions will be held at the tents designated for this, where you will be able to meet and greet your favorite artists. The schedule and the artists available for signings will be confirmed a few days before the festival and will be updated daily on the tents and through our social media and official app. You can’t bring your pets under any circumstances.